Lately, a lot of people have been complimenting my skin. I have always given credit to good make-up and make-up application, but I have noticed recently that my skin really has been more clear and bright. I have started wearing a tinted moisturizer on a daily basis versus a heavier foundation and there are plenty of days that I leave the house without any products on my face. Perhaps it’s the “pregnancy glow” that people speak about, but then there is the saying that “girls steal your beauty,” so who really knows. 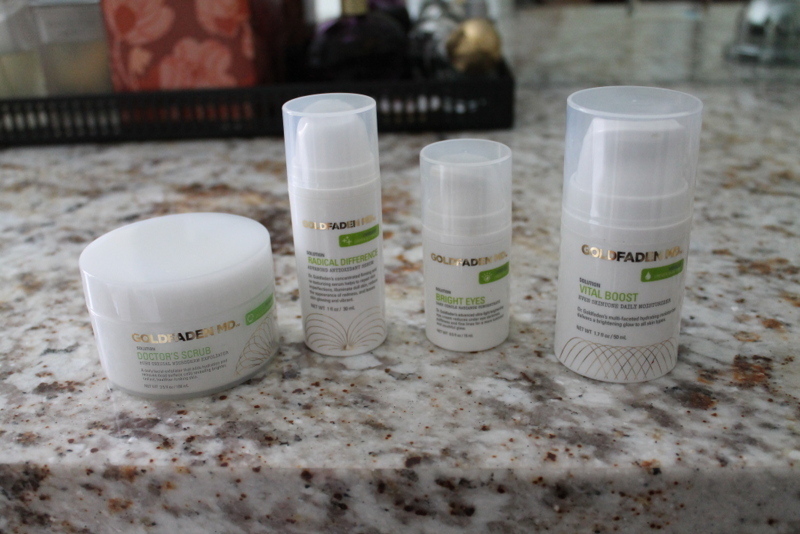 What I do know is that I have been using a new product line pretty religiously for the last month, and to be quite honest, I wish I didn’t love it so much because of the price point, but I truly do see and feel a difference in my skin! 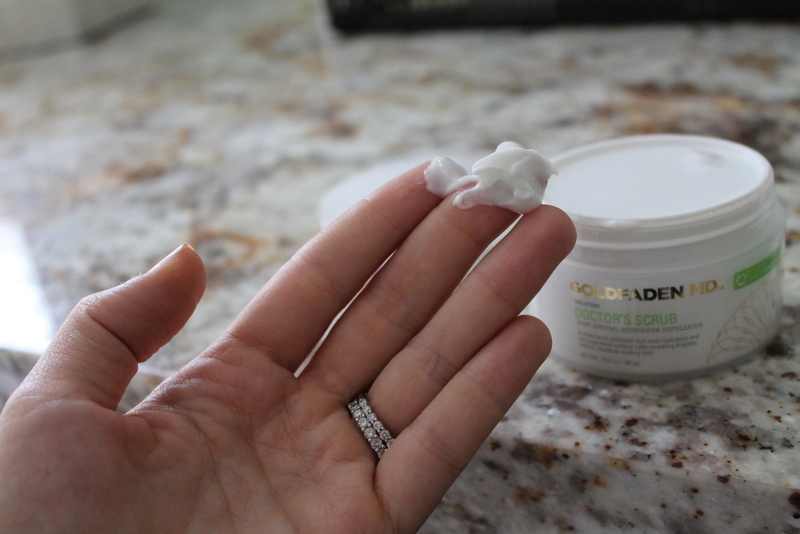 My routine starts with the DOCTOR’S SCRUB, which is an exfoliator. It contains ruby crystals that provide immediate cell renewal by polishing away dead surface cells. It claims to leave skin brighter, clearer and younger-looking. Again, I have only been using these products for a month now, and would love to do a follow up post in another few months to let you all know my thoughts. Since I have seen a difference in just 4 weeks, I am hopeful that my skin will continue to look better and better. A little product goes a long way. I use the above amount on my face and neck. 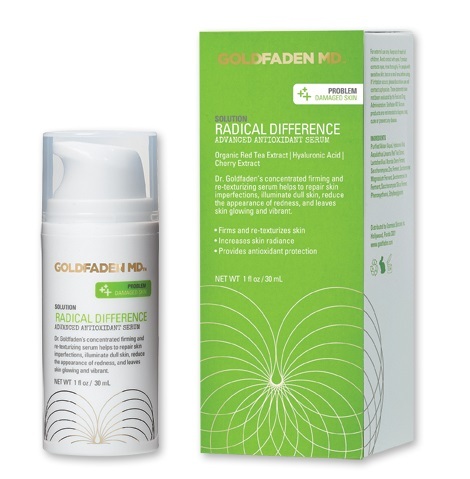 Next is the RADICAL DIFFERENCE, a highly concentrated firming and re-texturizing serum. It contains the anti-oxidant powers of Red Tea and Cherry Extracts to create a protective barrier that prevents and repairs skin imperfections. It also reduces the appearance of redness while rejuvenating the skin. One pump is all you need for your entire face. 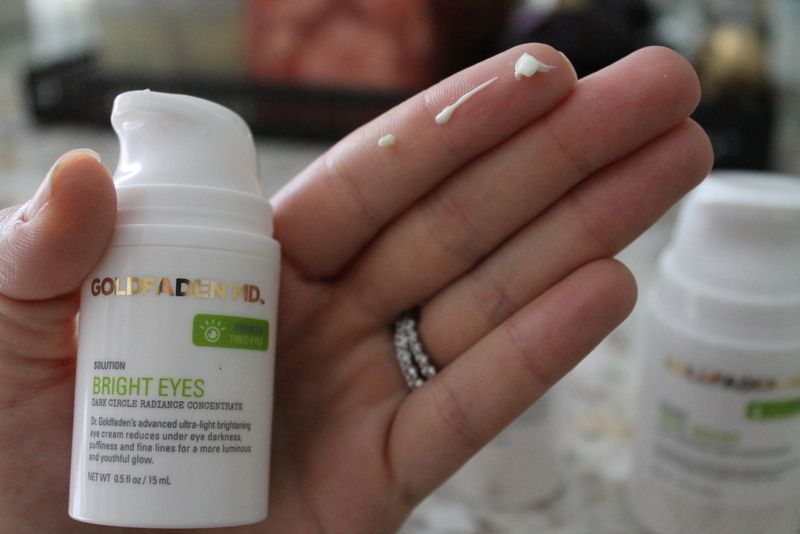 The next step is crucial in both my morning and evening routine as I suffer from the worst dark circles underneath my eyes. I know that’s pretty common for a lot of people with olive skin complexions, but if I don’t use a good under eye product, I literally look like I got in a brawl, and lost…big time. 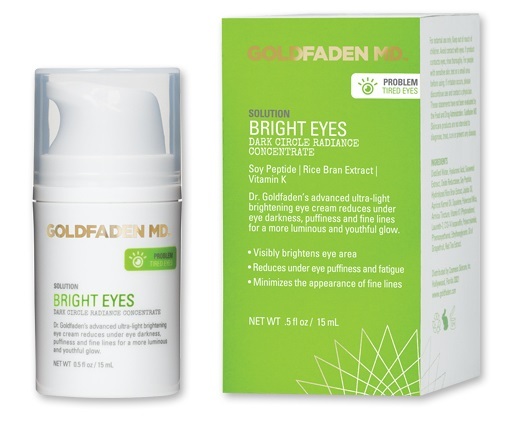 The formula in BRIGHT EYES instantly reduces the appearance of dark circles, puffiness, and fine lines. I only use a quarter of a pump per eye and pat it gently into my skin. Last is VITAL BOOST, a hydrating and brightening moisturizer that maximizes the skin’s immunity, provides powerful antioxidant protection and improves elasticity. 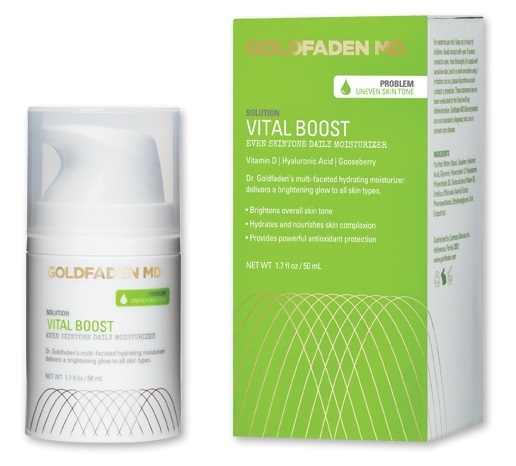 All products, product details, prices, ingredients and descriptions can be found on Goldfaden’s website. If you live in the Charlotte area, Jeffre Scott carries the complete collection. The only negative I have found so far is that it is on the expensive side (in my opinion), although I know it is comparable to plenty of other skincare lines. 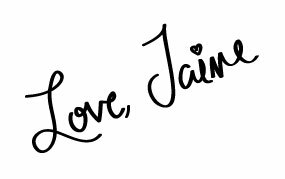 I always do my best to be as price conscious as possible in my posts, but if there is an item or product I love, then I’m going to write about it and be honest in my opinion, as everyone has their own budget and chooses to spend their money differently. God knows I’ve wasted plenty of dollars experimenting with so many different things, but investing in my skin now will hopefully save me from cosmetic and surgical procedures in the future!! Don’t mind my stupid face. Using a real camera to take a selfie is clearly taking things to a new level of embarrassment. OK, you definitely have me intrigued. 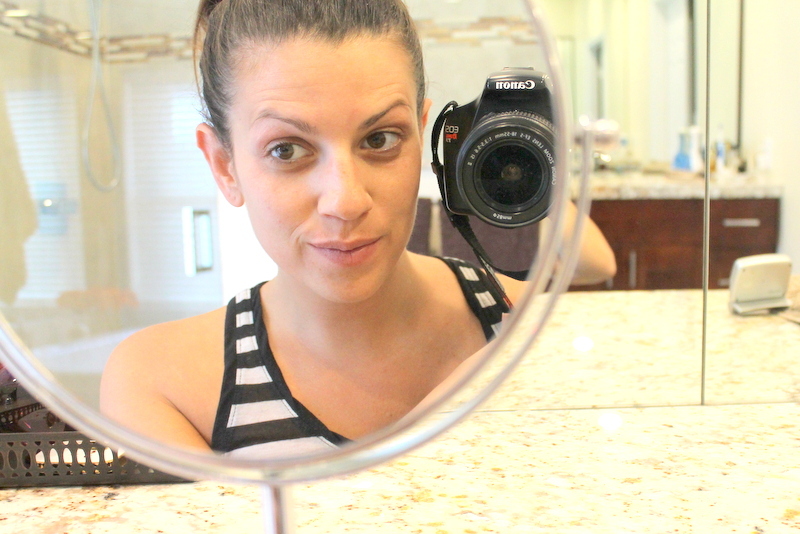 I am obsessed with skincare, so I need to check these out…and I do live in Charlotte!